This one, 15 to 20 minute cleaning routine has changed my life. I no longer have to spend hours cleaning on the weekends, and I get to wake up to a clean and tidy home each and every morning. If this seems overwhelming to you, I get it. Starting a new habit is all about baby steps, so just do ONE thing from this list each day until it becomes an easy habit, then add another. Before you know it, this entire checklist will be a habit that you don’t even think twice about! 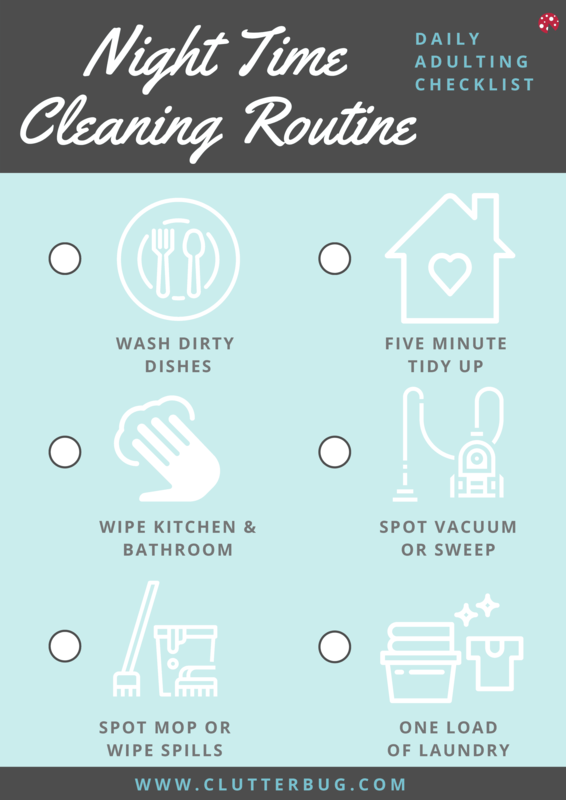 So, click HERE to download your FREE copy of my Night Time Cleaning Checklist and give it a try for yourself! The most important part of implementing any new habit or routine is your state of mind. Remind yourself that you are doing this for YOU. This is about your happiness and your piece of mind. You are not cleaning up after people, you are cleaning for you and only for you. You deserve to wake up to a clean and tidy home. What is your definition of Clutter?